Last week, on the 23rd of October 2013 was my graduation ceremony – Gaudeamus Igitur was sung, and I can now call myself a masters graduate of computer science from Imperial College London. 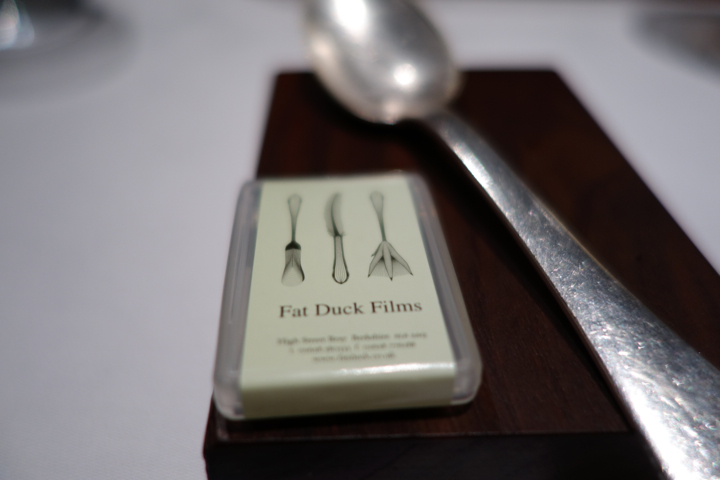 To commemorate the occasion, I decided to go to a restaurant I have been meaning to go to for a long time – The Fat Duck. 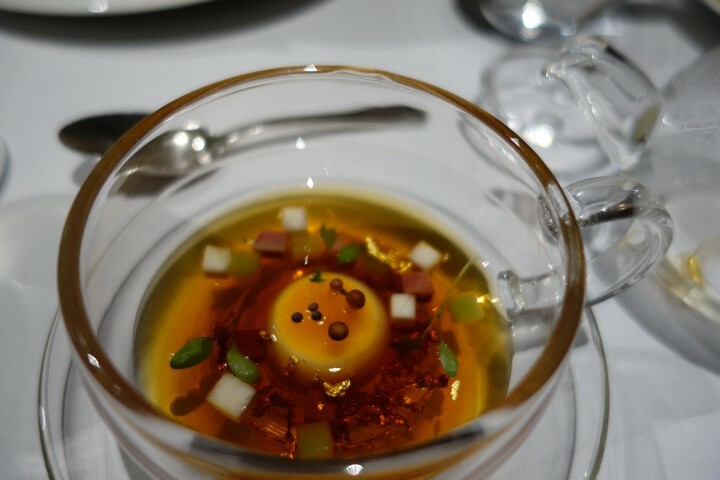 The Fat Duck is owned by Heston Blumenthal, and has been awarded its third Michelin star in 2004, and has had it ever since 1. 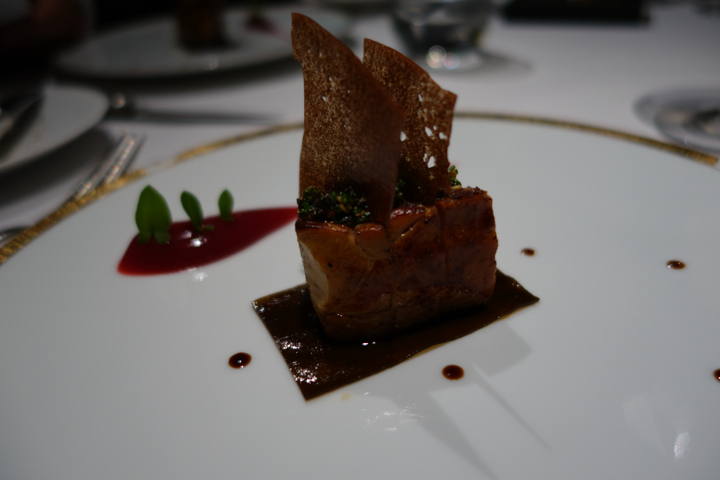 This was my first time visiting a three star Michelin restaurant, and you can tell there is a huge gap between a two-star and a three-star restaurant. 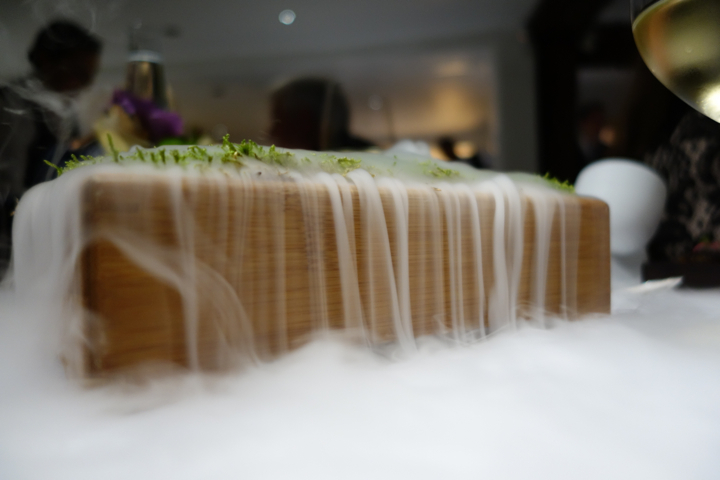 As many online reviews put it, attending The Fat Duck is an experience of a lifetime, and I wholeheartedly agree. 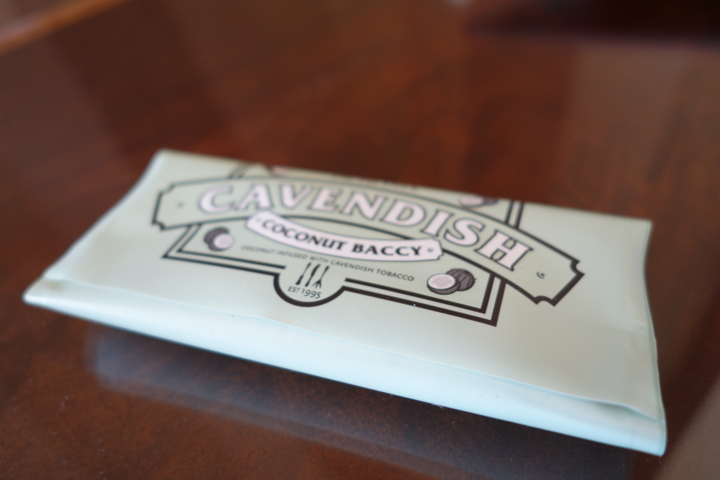 Everything about the restaurant is sublime – the setting is a small house in the village of Bray west of London. The restaurant itself is so unassuming from the outside that we missed it twice. In fact, I don’t think there is anything else in Bray except Heston’s two restaurants (the other being The Hind’s Head), and the experimental laboratories. There are only 13 tables in the restaurant, and considering this is a three star restaurant, it was difficult to get a seat. The reservation systems opens exactly two months in advance at 10:00 am UK time, and you have a 10-15 second window to make your reservation. I will now go through the menu at The Fat Duck, showing you some pictures of the dishes (unfortunately I did not get a picture of every dish) and hence communicating the philosophy of food that Heston is trying to show us. All the dishes are very technically difficult to prepare, and use specialized ingredients such as liquid nitrogen. Bear in mind though that Heston says “We do not pursue novelty for its own sake”, and that “The danger is that technology overtakes the value of the dish” 2 – point being is that all this technical difficulty of the dishes is just a means to end, which to Heston is the fact that “Eating is a multi-sensory experience” 3. As an example, pouring liquid nitrogen onto a wooden plate with fresh moss on it is supposed to diffuse the scent of the fresh moss and put you in the right atmosphere, to make you feel like you are really in the woods. 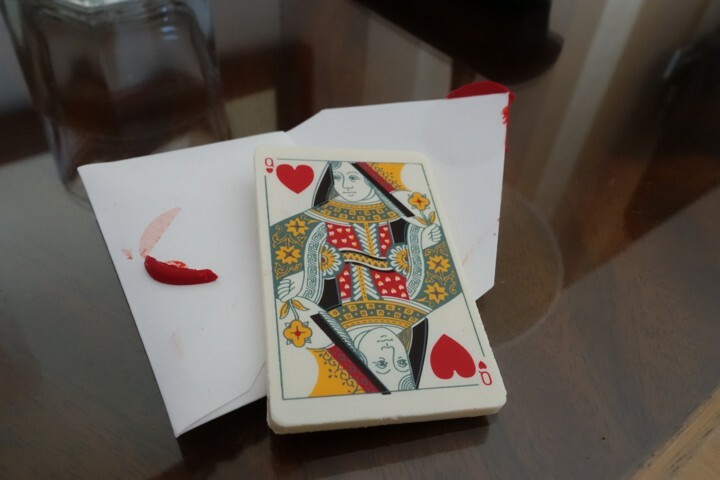 The evening began with some champagne, and a card with the fixed menu. The head waiter asked if there is any occasion, and I let him know that it was my graduation. 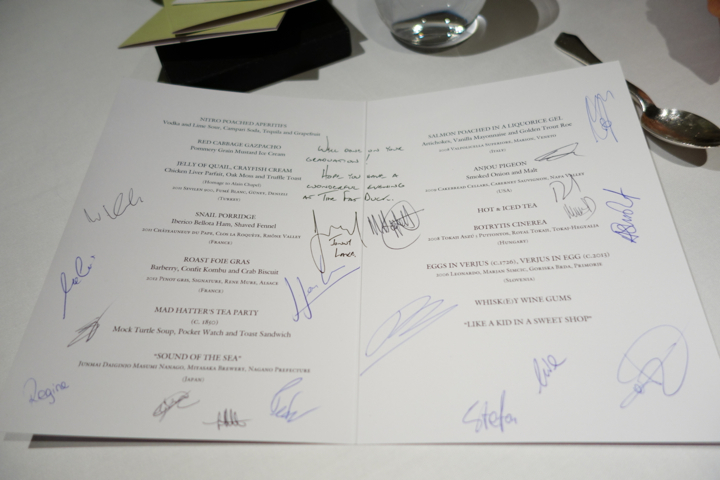 I then received the menu for the day, signed by all the kitchen staff, and the head chef who apparently is not in the kitchen that often. The aperitif was not your traditional aperitif – instead of a drink, what you get is tasty alcoholic foam quickly dipped into liquid nitrogen and served to you. Definitely something different and exquisite. What follows is a Red Cabbage gazpacho with mustard ice cream, of which I did not get a picture of. 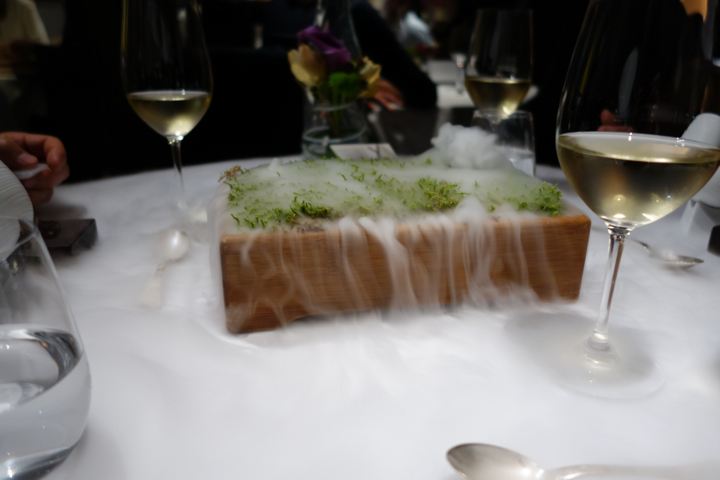 Next up is the first dish that targets more senses than normally, by having liquid nitrogen poured on fresh moss to disperse the scent and put you in a woody atmosphere to enjoy your Jelly of Quail and Crayfish cream with Truffle Toast. 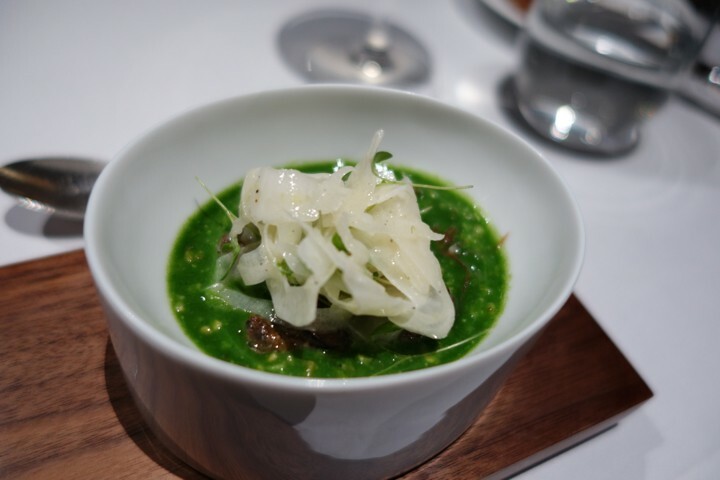 Next, we have a snail porridge – it appears this dish is inspired by taking the standard French escargot dish, and changing the proportions of snails to the sauce. 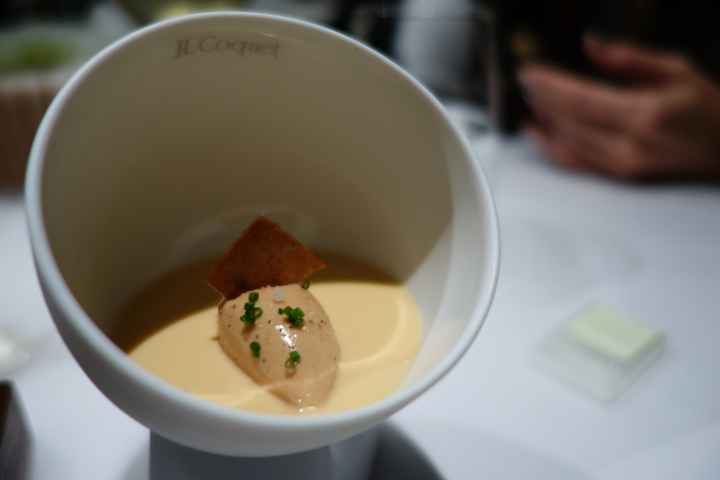 Following, we have an incredibly soft roast foie gras with kombu confit and a crab biscuit. 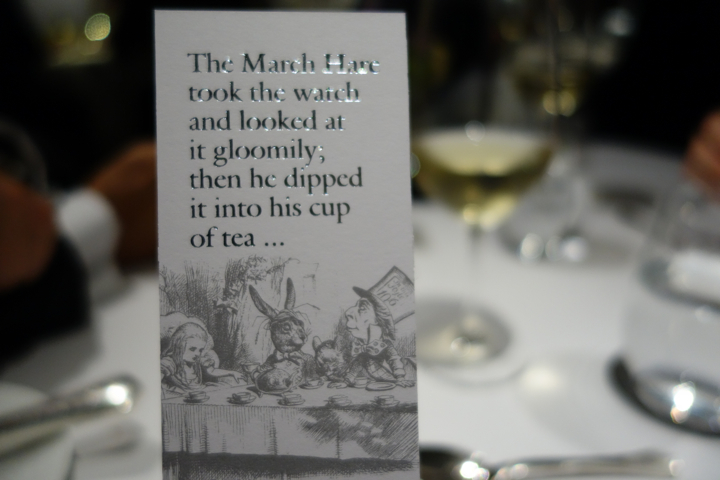 Next, the Mad Hatter’s Tea Party. Following, I think is what I could name one of the dishes I enjoyed the most, probably because of the setup of the whole dish – it is called “Sounds of the Sea”, and consists of various pieces of fish, synthetic seaweed, fake sea foam (which actually tastes like sea and seaweeds! ), and edible sand. 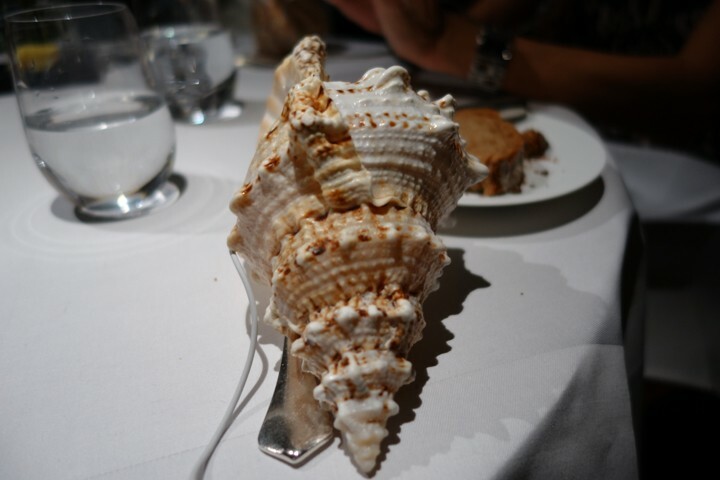 Moreover, you are given a shell with an iPod nano inside and headphones, playing the sound of slow waves crashing on the on a seashore – this is what completes the dish. 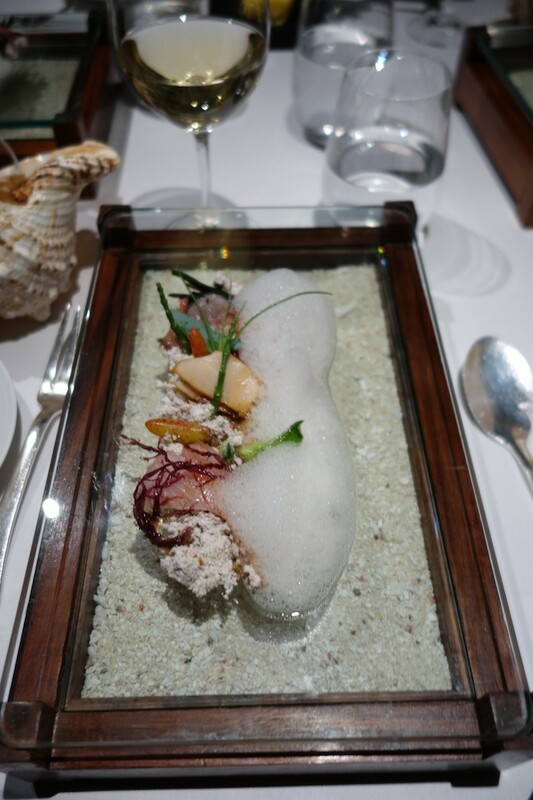 I can definitely say that I felt much more absorbed and in a kind of flow state than any other dish; you are not talking to the people at your table, can barely hear the conversation of others, and are just completely concentrated on the sound of the sea and the sea-themed food in front of you. The Sounds of the Sea dish itself. The edible sand and foam are incredibly realistic. Next we had the salmon poached in liquorice gel, of which I forgot to take a picture, but as you can guess the salmon was cooked to perfection. 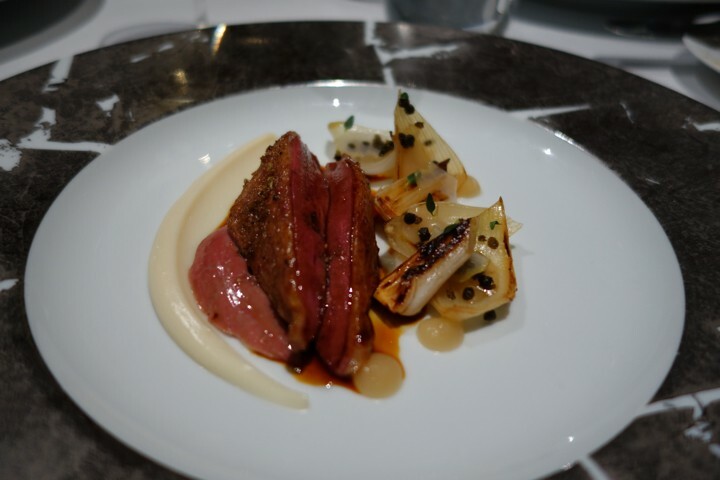 The “main” dish of the 14-course meal was the Anjou pigeon. This I believe is the part of the menu that changes seasonally, depending on what good meat is currently available. 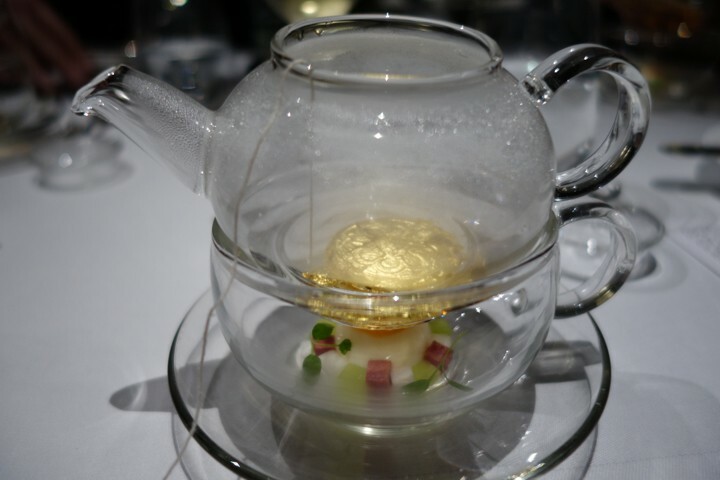 Moreover, it looks more like a standard dish you would expect from a very good a restaurant – a break from the standard Fat Duck creations. The separation between the first part of the menu and the desserts is done by the “Hot and Iced Tea”, which indeed is hot on one side, and cold on the other side. 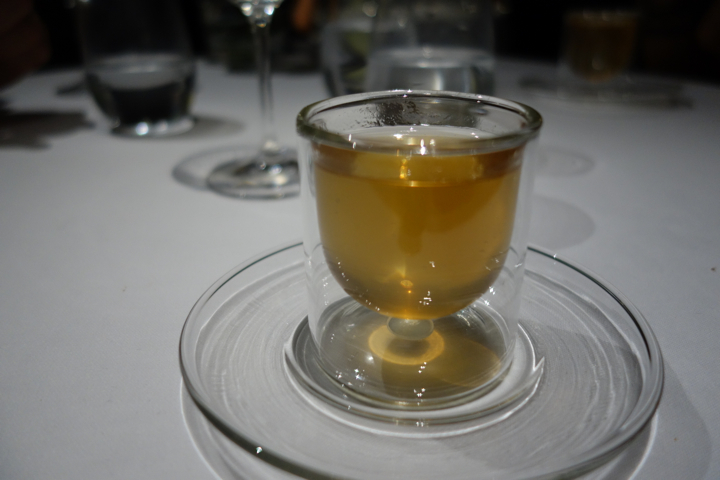 This is achieved by having a watery gel that preserves consistency and texture over a range of temperatures, allowing the chefs to put its cooled version on one side, and the hot version on the other side (utilizing a divider in the cup). If you so wish, you can turn the cup 180 degrees and see that this is how it actually works. Next up is the first dessert, which I think is probably as technically challenging and interesting as “Sounds of the Sea”, and I would say its my second favourite on level with “Sounds of the Sea”. 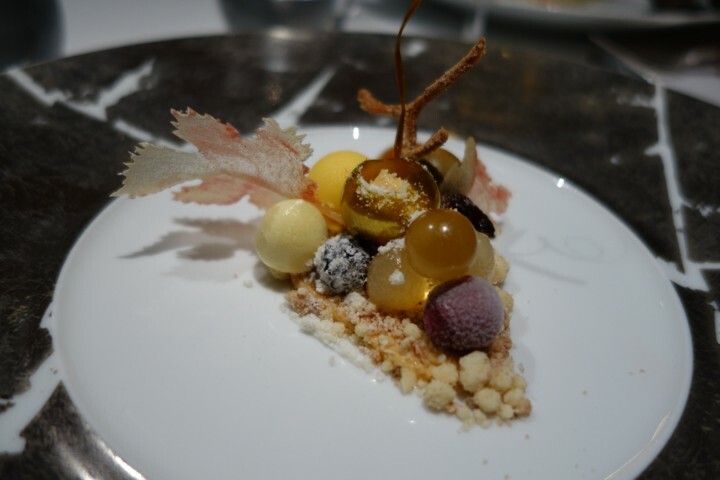 The dessert is formed in a grape shape, each grape formed and tasting quite different. The name of the dish is Botrytytis Cinerea, which is a fungus that grows on grapes and gives a distinctive taste to some sweet wines such as the Hungarian Tokaji. There you have it – a dessert inspired and created to taste like fungus. 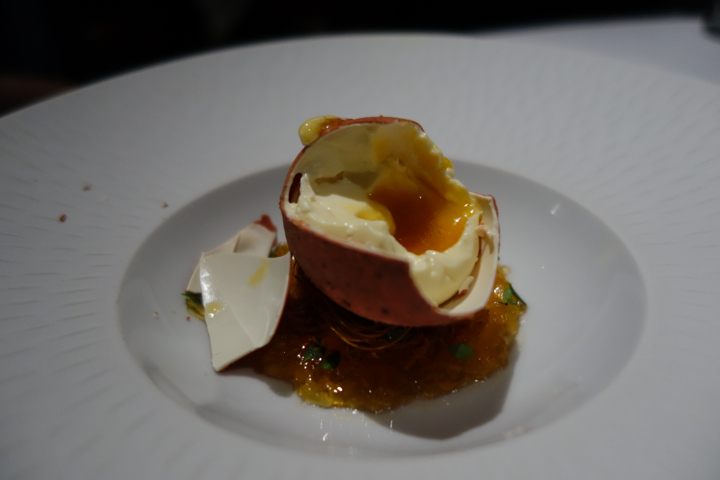 For the second dessert, we have something that looks like an egg, but isn’t. 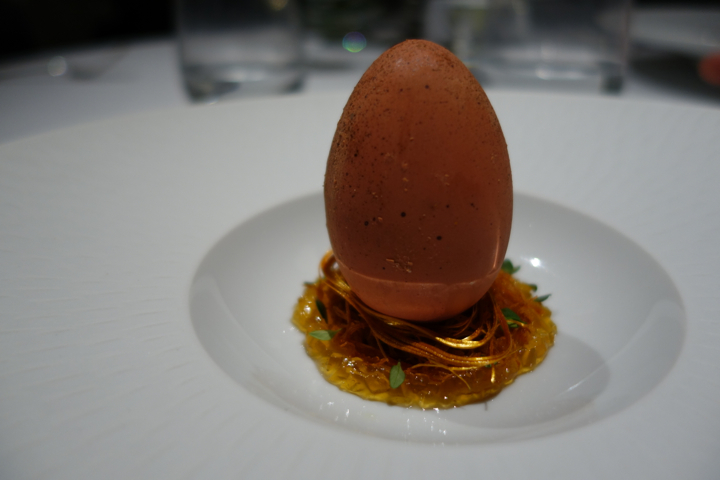 What we do have is a chocolate egg (although pretty much indiscernible from a normal egg; the chocolate egg has all the usual characteristics of a normal egg such as the color or the rougher surface and occasional darker spots), together with an ice cream interior serving as the white and a concentrated thick mango juice serving as the yolk. As you can see from the pictures, the result is both aesthetically pleasing and a joy to eat. The next dessert is whiskey wine gums. 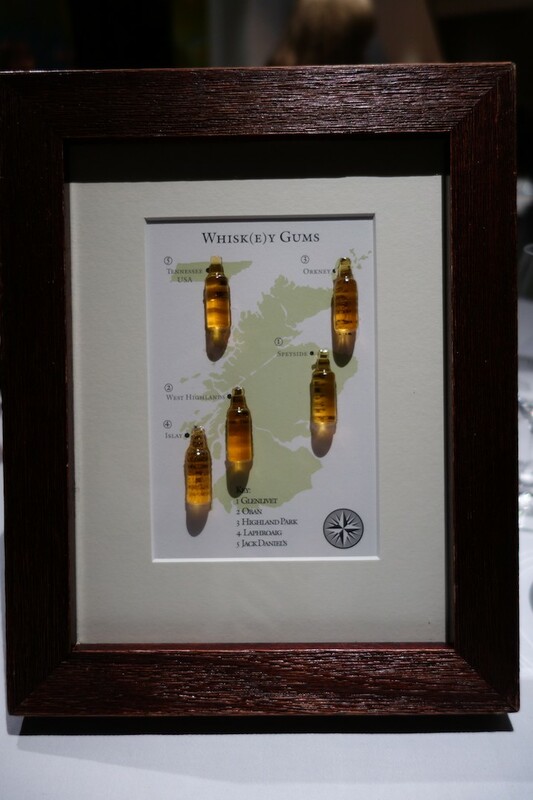 There are five of them, going up in the intensity, and stuck to a glass board with a map behind to indicate the region where the whisky comes from. You would think that it would not be easy to tell a difference, but each of the whiskey gums is substantially different from the previous one. The presentation of this is also phenomenal. 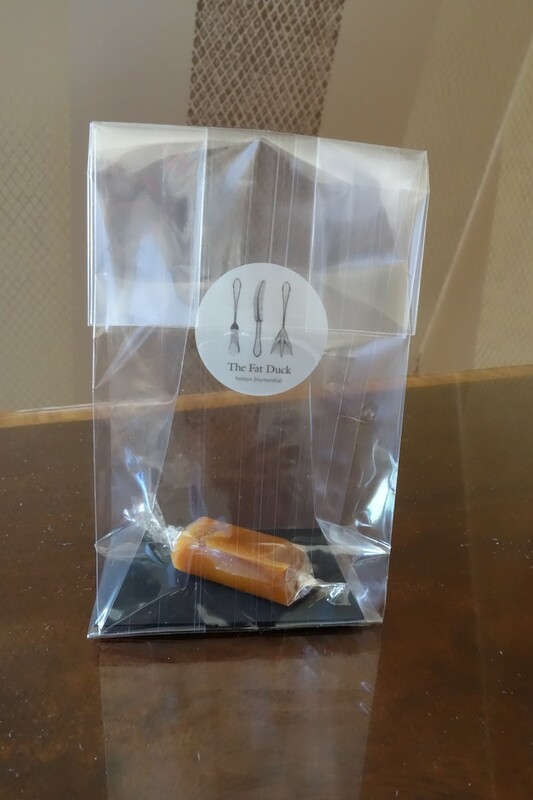 There is one more dessert, “Like a kid in a sweet shot”, but it comes in a takeaway bag, and I believe you are meant to leave for the next day – after 13 courses I was already very full and the enjoyment was much greater the next day. I followed the whiskey gums with tea. 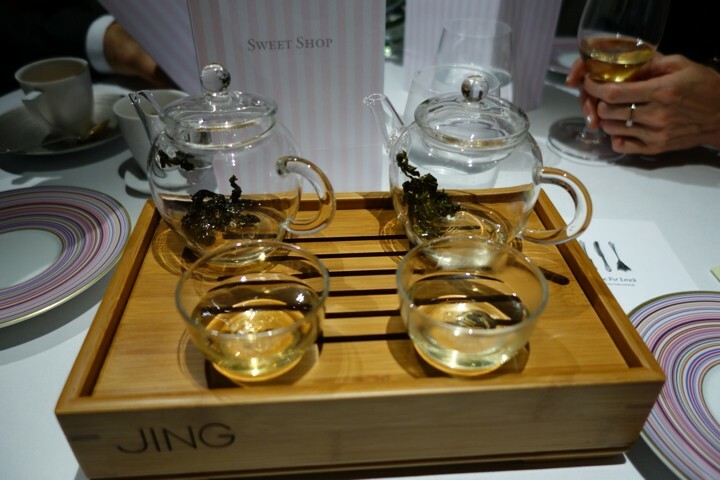 It definitely looks like Heston is a tea person, since there are only two coffee positions on the dessert menu, while there are multiple teas, ranging from 5 to 50 pounds. 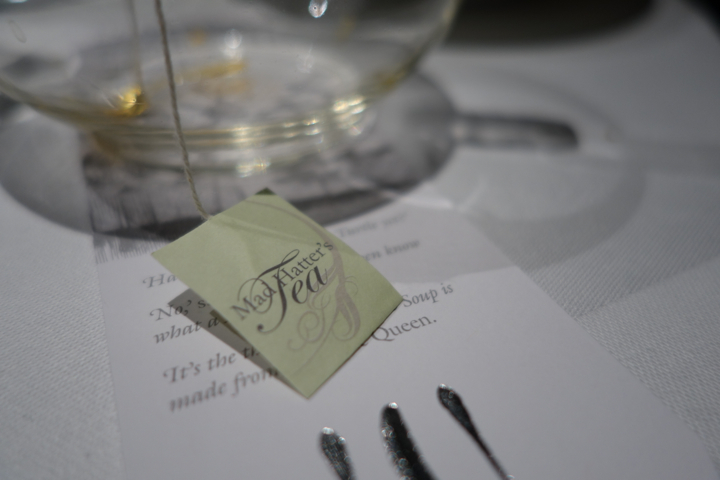 I opted for a tea tasting menu with two different Oolong teas. This marked the end of the more than 5 hour long once-in-lifetime food experience. I was lucky enough that there was a Polish cook who, upon learning there is a table with Polish people, wanted to meet us. We were then shown all the ins and outs of the restaurant – the main kitchen itself is tiny, and most of the food is pre-prepared at the laboratories next to the Fat Duck, and only finished up in the main restaurant. I also got to see all of the laboratories, and the “Experimental Kitchen” room that features in Heston’s TV appearances. Apple Pie Caramel – the foil is edible! she made some tarts! 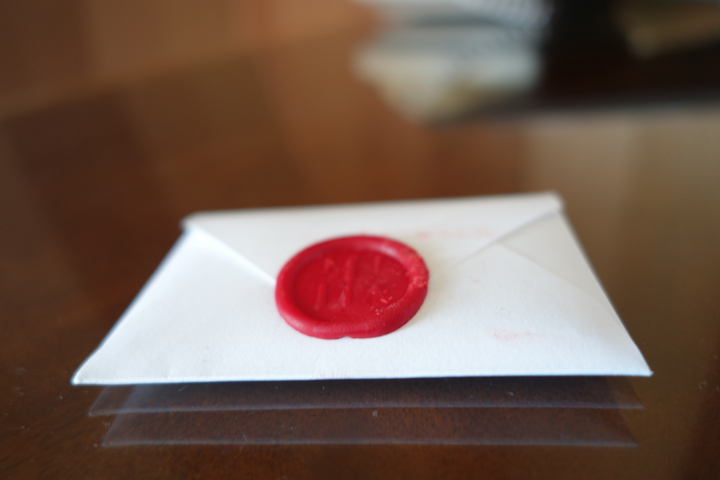 Remember, the “wax” seal is also edible. 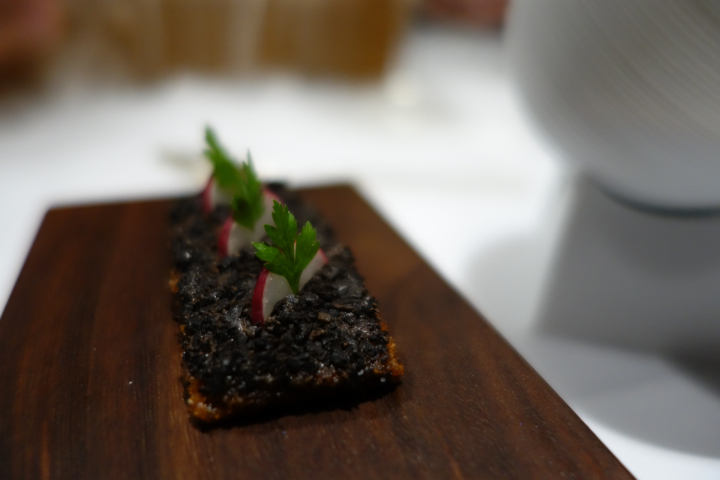 Overall, I had a fantastic experience at The Fat Duck, and it was just the perfect way to celebrate my graduation. 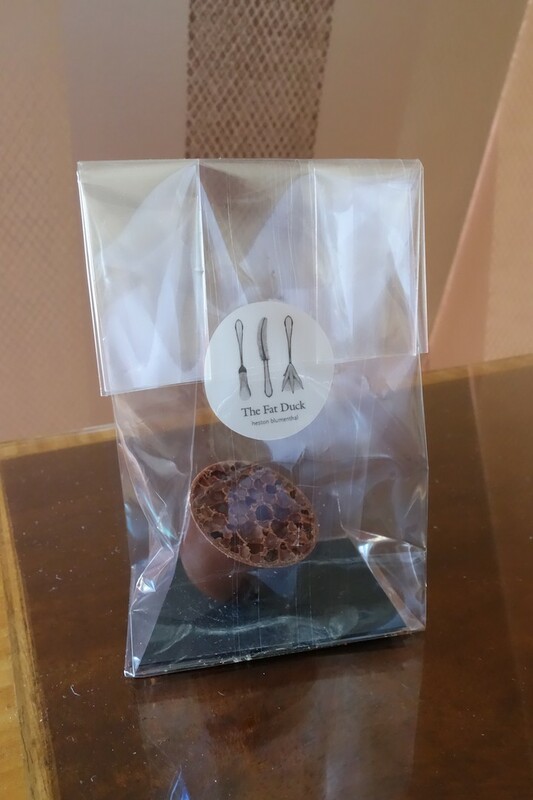 If you like good food, are open to having completely new culinary experiences, and aren’t picky4, I can wholeheartedly recommend The Fat Duck for a culinary experience of a completely different sort of what you’ve probably ever had.